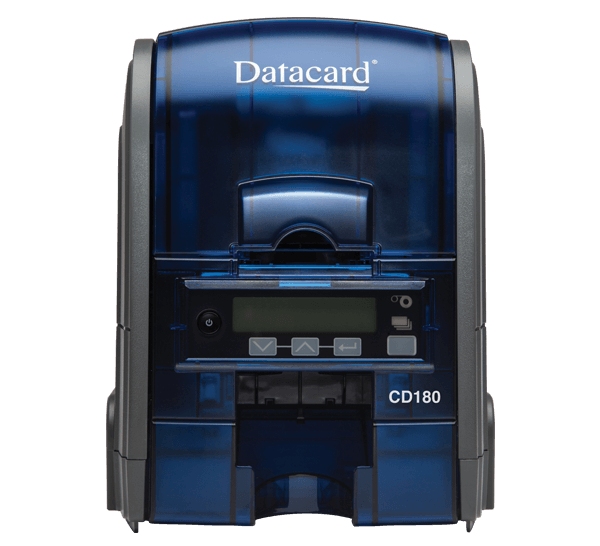 Maximize productivity and increase ID card issuance efficiency with the industry-leading features of the Datacard® CD180™ card printer. Faster printing, more reliable performance and the highest resolution available make the CD180 card printer a great fit for a variety of applications, including state and local governments, corporate or educational applications. The Datacard® CD180™ card printer delivers the perfect mix of affordability, security and simplicity to get your ID card issuance program started. New TrueMatch™ printing technology creates vibrant, crisp and clean credentials that are both secure and visually impressive. The CD180 printer lets you produce predictably outstanding images by emulating the sRGB industry standard color space for improved color management. There’s no learning curve with the CD180 printer. The printer display panel automatically alerts users when supplies are running low. Installation and printer operations are easy to understand with the helpful documentation tools provided with the XPS Printer Driver installation. The browser-based printer manager makes it easy to control printer settings. The CD180 card printer fits on any desktop and is ideal for many card printing applications. It is equipped with a 100-card input hopper and 25-card output hopper for easier desktop functions, with the option for single-card feed and extended 100-card output hopper.